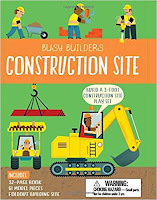 Over the summer, I received review copies of three Busy Builders sets from Silver Dolphin Books: Construction Site, Fire Station, and Airport. Miss Muffet and I had a lot of fun building and playing with each one, and I shared photos on Instagram, but now, with holiday gift-giving on the horizon, I'm finally getting around to writing a proper review. 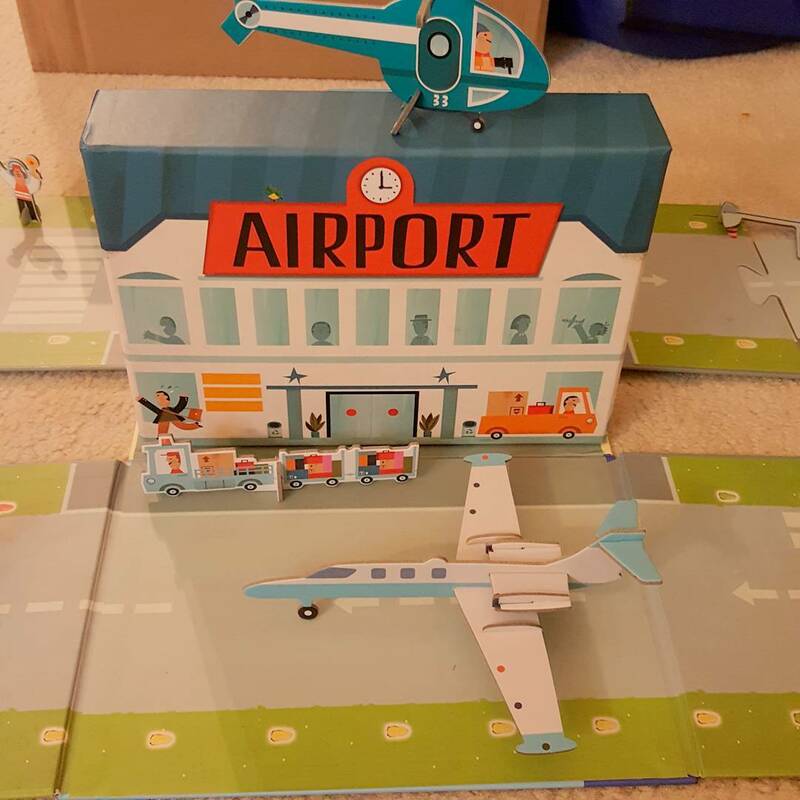 Each of these sets is contained in a box which opens up, with a flap on either side, to become the central building of each playset: the firehouse, the airport, and a school for the construction workers to build. 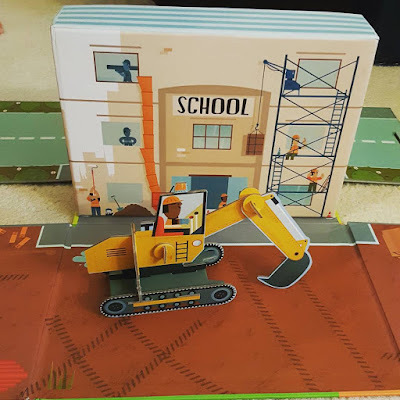 Puzzle pieces snap onto the flaps to make a road going around each building, and there are various other cardboard pieces which punch out and are used to build vehicles, people, etc. A book is also part of each set. 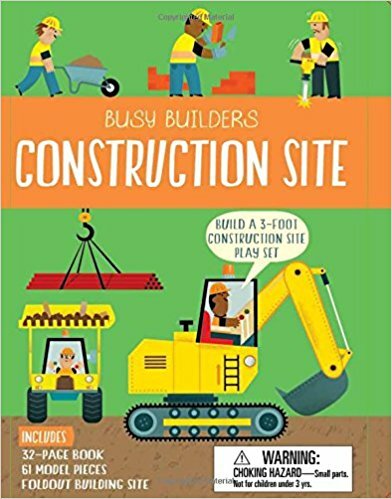 These colorfully illustrated volumes provide lots of facts and vocabulary associated with each setting, as well as the instructions for putting together all of the models. Because my daughter has only just turned four, she couldn't do much of the actual building herself. 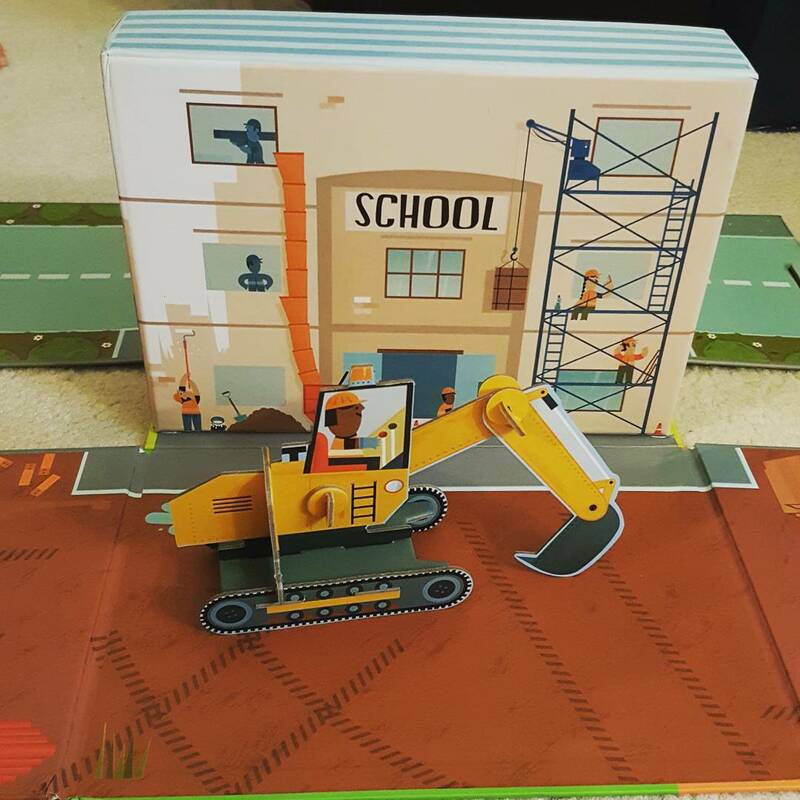 She was able to put the stands on the people, and to put together small accessories like fire hydrants and traffic cones, but the larger tasks of putting together the firetruck, airplanes, and diggers were left to me. If she were six or seven years old, however, I think she could have put together everything herself, as all of the instructions are clearly illustrated and all that is required is snapping cardboard pieces together in the correct order. The books are surprisingly full of information, despite being only 32 pages, a good chunk of which is devoted to building instructions. There isn't much of a narrative to any of them; rather, they illustrate the vehicles, equipment, and buildings pertaining to the fire station, airport, and construction site, label each item and provide short blurbs to explain how they are used by the various workers. Miss Muffet was not yet reading when we first received these, but she still spent a good long time poring over each book and even making up stories about the characters in each illustration. 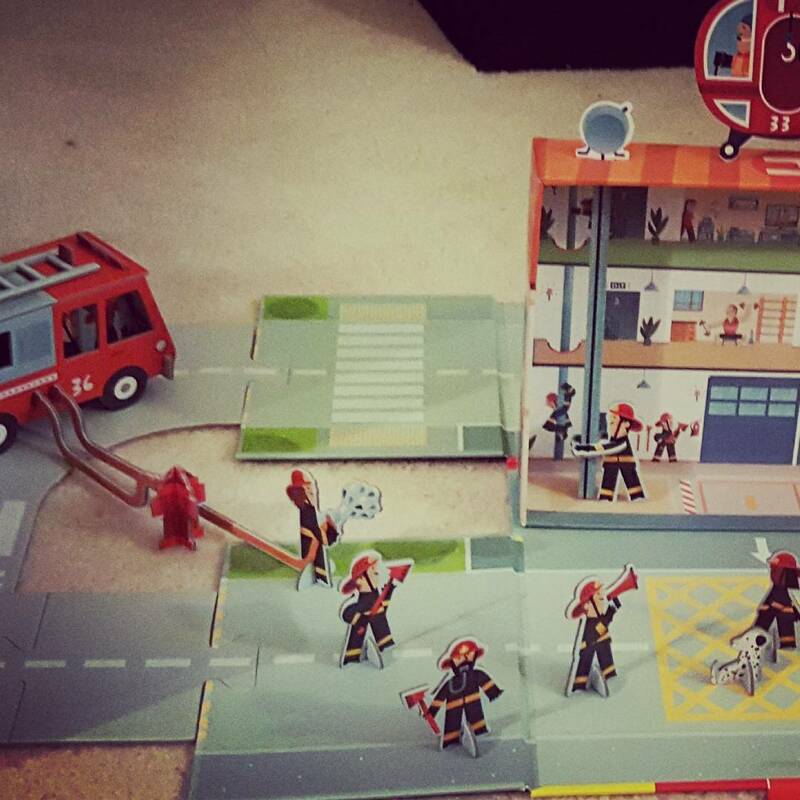 The books also helped inform her play, as she had very little knowledge of construction, firefighting, or airports prior to playing with these sets. Unfortunately, as much as these kits really enriched Miss Muffet's first lesson about community helpers, there were some problems with the playsets. For one thing, the boxes which serve as the buildings for each set are weakly attached to the flaps that fold out from them, which makes it easy for them to come apart. One of our sets arrived with the box already completely detached, and I had to glue it back together. This was easily accomplished with plain Elmer's white glue, and the set was still perfectly usable after the fact, but it was disappointing to start out with a broken set. The puzzle pieces that make up the roads also don't fit together perfectly, especially on a carpeted floor, so that was frustrating for both me and my daughter, as pieces kept popping out of place whenever we pretended to drive a vehicle over them. This problem seemed to be most pronounced in the fire station set and least troublesome in the airport, but none of the three had pieces that were a perfect fit. We ran into similar difficulties with some of the stands for the people and with certain pieces of the airport aircraft and the fire station's helicopter. In cases where a piece was too loose, it would fall off whenever the model was moved. In other cases, the pieces were such a tight fit that they wound up bending or tearing slightly on their edges when I tried to put them in place. Again, these were not problems that interfered heavily with our enjoyment of the sets, but it was frustrating to continually have to pick up wheels or a tail from the floor every time Miss Muffet pretended to fly a plane across the sky. The final problem I encountered was with storage. While the sets are self-contained and all of the pieces can be stored in the buildings/boxes, this is only the case if you take each set entirely apart between uses. I was not prepared to reassemble every single model every time my daughter wanted to play with them. Instead, I wound up storing all of the assembled vehicles in a wooden tray which I could take down from a shelf upon request. For an older child, though, it might be appealing to build the sets over and over again, in which case storage would be very easy, as the boxes with everything tucked inside can fit easily onto a bookshelf. Though these kits are not likely to last as long as something made of plastic or wood, they are a nice inexpensive way to engage kids who are interested in cars and trucks, community helpers, model-building, and who are desperate to know every little detail about how people do their work, and the tools they use to do it. While my daughter was able to enjoy these as a preschooler with plenty of adult supervision, they would probably be best for a slightly older child who could work on them independently and feel a sense of pride in having built the models himself, and who can be careful enough with the delicate cardboard to help the sets last a while. 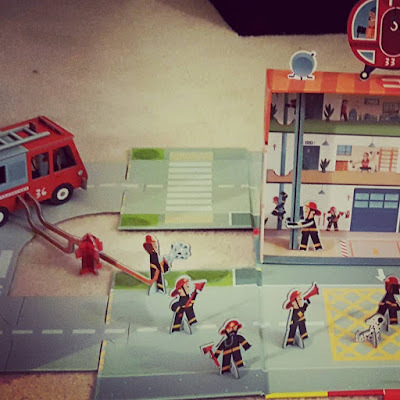 Though my favorite of the three is the fire station - it was the easiest to assemble, and had a good mix of people and vehicles - any of these would make a great gift for an elementary-aged child, and Miss Muffet and I recommend them.